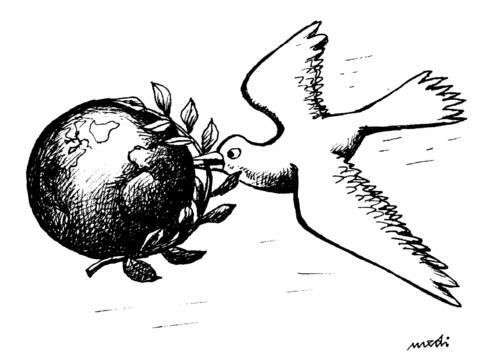 Perhaps, the most powerful tool capable of making us achieve peace in the context of a temporal span is Politics. With the world having realized the need of a common political body after the World War II to settle differences between nations and prevent the chance of any further Hiroshimas and Nagasakis witnessed during the war, the coming up of the United Nations Organisation was pivotal in the search for peace. The UNO has since then successfully come to settle many tense situations that might have lead to wars but sadly, has not yet succeeded in finding peace. Yet, with its organisations like UNESCO, UNICEF, FAO and others, it has come very close to achieving true peace, a positive peace and not just the absence of wars. More and better efforts are required by all countries of the world to come together in this way and try to work for a golden time of the human race. The political organisations within the countries itself must realise their potential and come forward to settle differences and address grievances. The goal of politics at all levels should be contentment of all parties concerned. Even though it is a task easier said than done, the capabilities of an organised approach can undoubtedly lead to a solution. It is realised here that the basic challenge to a political solution towards peace is of satisfying the needs and wants of all involved in the activity. This problem is indeed multifarious and complexities range from constitutional to administrative to soci-psychopathological. Marx and Engel first gave the model of a society divided into large collectivities or classes whose interests are in basic conflict. Since their interests are gained at the expense of each other, it would not be surprising to find the inability of them to come up with a civic harmony. It is also argued by them that the economic structure of society always furnishes the real basis from which we can alone work out the ultimate explanation of the whole superstructure of juridical and political institutions. With the exclusion of a social base to class motivations based on such theories, the possibility of different sections of society coming together to achieve something such ‘non-tangible’ or ‘abstract’ like world peace seems to be eliminated. But at the same time, there are different political theories that argue in contrast to this. Talcott Parsons in his action theory argues that, by co-operation, different groups in society can each obtain greater benefits than would be the case if they work in competition. It would indeed be an optimist’s choice to approve the latter theory over the former so as to keep the quest for peace true and alive. But the original lesson to be learned here is not whether the social classes are in conflict or not, but that the political ideologies themselves are in conflict to each other. The world is a mash up of ideologies with daggers drawn to each other. The Right vs. The Left, The Patriarchy vs. Feminism, Conservatism vs. Anarchy and so on and so forth. There seems to be little room for clear thought and reasoning as people’s minds are filled with and eyes clouded by theories they believe to be true- Socialism, Marxism, Radicalism, Ecologism, Conservatism, Communitarianism, Thatcherism and what not. The world simply, doesn’t seem to believe in the concept of a common good. It seems they have given up all hopes for any sort of peace the world can achieve and are thus trying to cash in on some thought literature they have acquired to further their individual interests in the name of a fight for their ideological goals. To sum up the discussion of political ideologies, it would be fitting to take a perspective of Sri Aurobindo who remarks that Nature has been trying to strike a balance between the perfection of the individual and peace and security of the group and that the individual is required to realise progressively his spiritual bond with others in the social context. Man direly needs to realise this and come up with not another ideology but an idea of harmony and keeping the world peaceful at large.